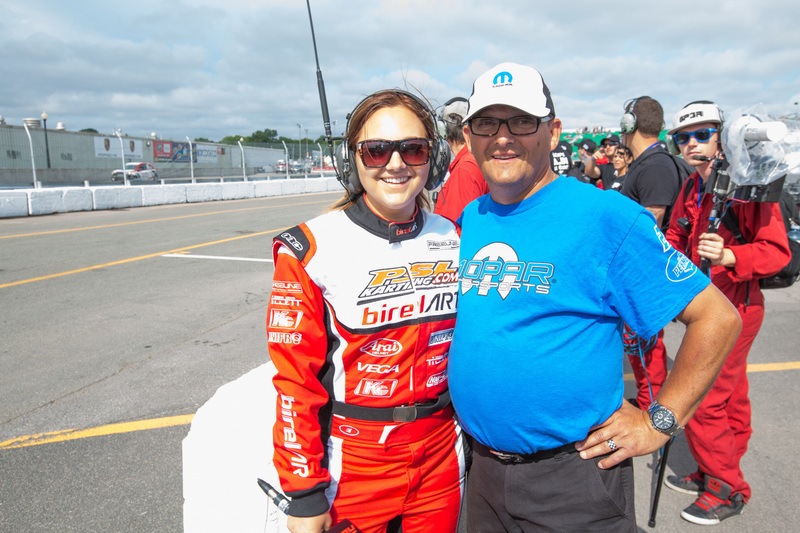 Special Feature: My Karting Life by Tanya Beaudin – CKN | CanadianKartingNews.com | Because Karting is a way of Life! When CKN first asked me to write an article for their website, I have to admit, I did not know what type of colour I wanted to give this article. And then I realized that CKN is all about karting and the passion for this sport so I started thinking about all the years I spent at different race tracks around Canada for this unbelievable sport. It also made me remember that karting is what gave me the bite for my current love of television. Long before getting involved in the karting world, I was heavily involved in road courses, bigger series like Champcar, Atlantic, some Quebec championships like Formula 1600 and those kinds of series; being one of the grid officials with my family. But then a couple years after our team received a call to be officials in the karting industry. That is when it all started. That is when I saw how young you could be to begin in the sport, how passionate you had to be to spend most of your summer at the track, and how homely it felt. But when did the television part of my career start? I had the opportunity to work with some young karting drivers on the PR side of their career. Being a student in Communications I wanted to give back to these kids. Some of them were asking about interview tips, how to answer questions, how not give too much information, how they could be less stressed in front of a camera or in front of public when they had sponsors’ presentations. Even though it was only a sport to these kids, I figured they wanted it to become a career, to become something they felt good at doing. So as well as helping them on this side of the sport, I started being interested, myself, at the television aspect of it, how important it could become for the sport to be televised, how important it was for sponsors to be seen, how amazing it would be to be the one asking questions at the end of a victory. Around that time, I was struggling between the decision to pursue my studies in public relations or television and radio. I really wanted to be able to live because of this amazing sport. After a couple months I made the decision to go on the television path, I have to say, my first interviews were all with karting drivers, Quebecers, Canadians and Americans, and I was having a blast! Some important websites in the racing world, such as Flagworld.com & CKN, asked me a couple times to join their team and put my effort with theirs for videos around track and some interviews with drivers. At this point I was still shy to call myself a reporter or to even enter a teams tent to ask drivers to join me and have a little chat in front of a camera, but that was the best school I could ask for. I remember some drivers declining interviews because they were too shy, I remember some of them being so passionate and so good at being interviewed. One of the drivers I had the chance to interview in my early days as a racing reporter was A.J Allmendinger to the 2014 SKUSA SuperNationals in Las Vegas. He wasn’t there as a NASCAR driver, he was there to have fun, and I have to admit, this is all karting is about: FUN! Some of the karting drivers I worked with in their early career are now pretty impressive on the road to a big racing career. Some of them were so shy at the beginning and now to see them involving and answering questions like they’ve always done it makes me happy. I am proud to see where they are heading. Today, I do call myself a racing reporter since it is my job. I live the goal I set myself around 13 and I am unbelievably happy to do so as such a young age. I tend to pursue my goal to represent the karting and racing industry and to properly teach people about it. NASCAR on TSN is an incredible experience that I would never have thought of doing only eight months after television school. It is also always like doing a final exam, you’re never quite sure if you did it well or if you will be cut because you did not do well with that pit stop comment. But every time I put on my TSN suit on, I remember where it all began, and I remember how I felt and how drivers felt too, and that just reminds me to have fun! One of the things I love to do the most when I have a weekend off my TSN schedule is to go back to a karting event. There is nothing like a good karting event to make you feel like yourself, to put your heart back at the good place and to see how the big family is doing. Because you know, this is all about the passion, the family, the fun, and the simplicity of this discipline. The sport might change, the people might be coming and going, different motors, different teams, but at the end of the day, karting is karting. There is nothing like it!